It's more like a conspiracy that on the eve of every year's iPhone event, Apple will push 'warm and friendly' messages reminding us of 'your iPhone storage is (Almost) full'. If you, like millions of other iPhone users, are in a constant battle to free up more space on your iPhone for apps, photos and movies, we have a Simple Hack and a bunch of Pro Tips for you. It's a common pain that when trying to download a new app or take a few more photos, you may have a dreaded message saying "not enough storage" or "your iPhone is full". For the users with entry-level model of iPhone 5/6, the problem gets even severer. Original discovered by a smart Redditor (eavesdroppingyou), this simple hack will unleash gigabytes of free storage on your iPhone without deleting anything. Step 1. Check Your iPhone Storage. Not necessary but you'd better have a check with your current storage as a marker so as to find the change easily. 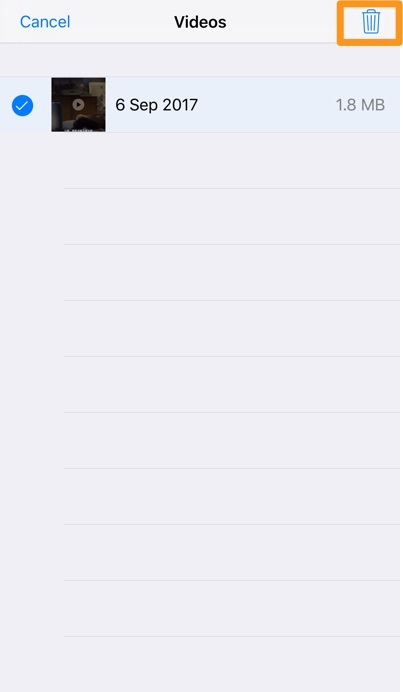 [iOS 11] Open to Settings > General > iPhone Storage > Check how much free storage is left on your iPhone. Step 2. Rent A Giant Movie on iTunes Store. Go to the iTunes Store > Movies > search for any long film (The Lord of the Rings: The Two Towers is a good choice at 6.83GB). The movie needs to be larger than the amount of space left on your phone. Tap the Rent button twice, bearing in mind you won't actually be paying for the film as you won't have enough space to download it. 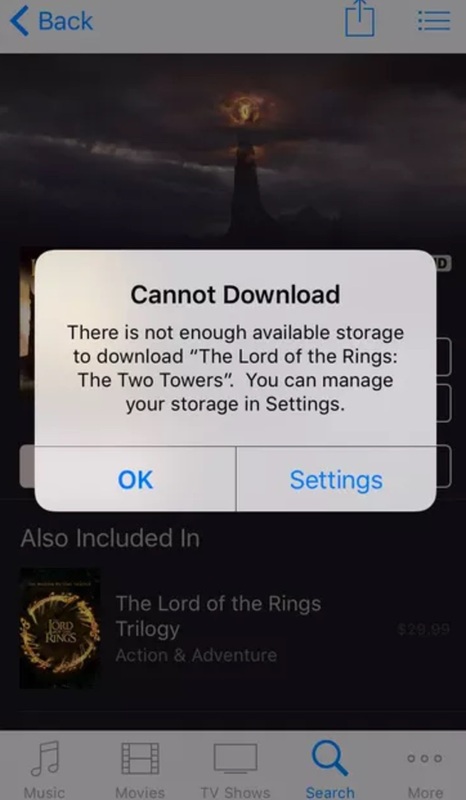 After you see that "There's not enough space available to download your rental" message, go to Settings > General > iPhone Storage to see if there is more free storage available. Many users reported that by repeating this process, the free storage could constantly grow until your iPhone storage is higher than the movie you try to rent. Even though Apple never ceases introducing new features to relief iPhone storage burden, running out of storage space remains a problem that many users still have to face. Thanks to iOS 11â€™s new recommendations for managing storage, free up space on your iPhone becomes a much easier task. 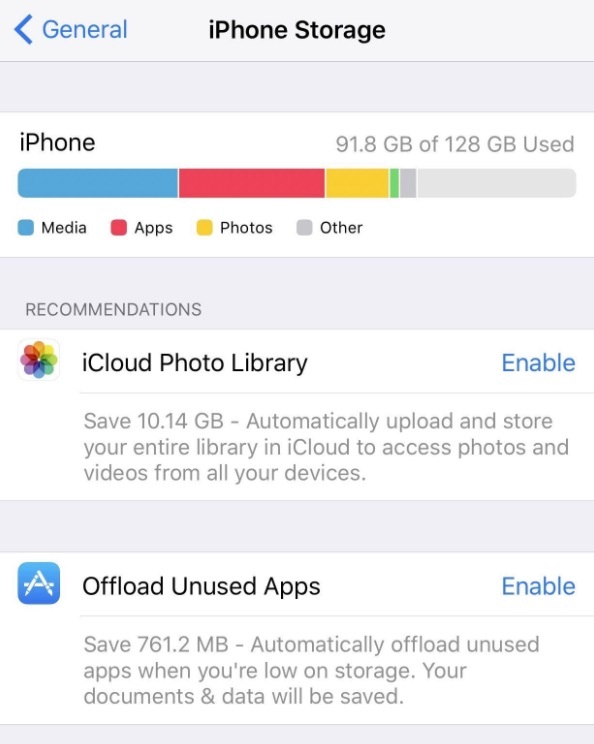 If you still fully loaded your iPhone with photos, movies and games, try this complete roundup tips for freeing up space on iPhone. 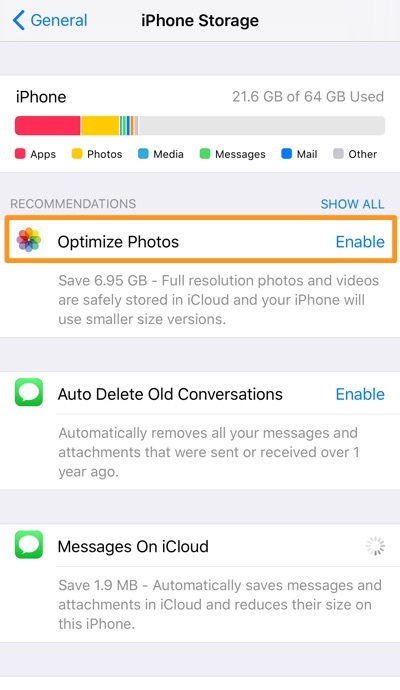 Originally featured on macOS Sierra, the iPhone Storage Optimizing Recommendations allows users to quickly manage and optimize your iPhone storage. Open Settings app > General > iPhone Storage > Take a look at the recommendations, and enable some to save space. 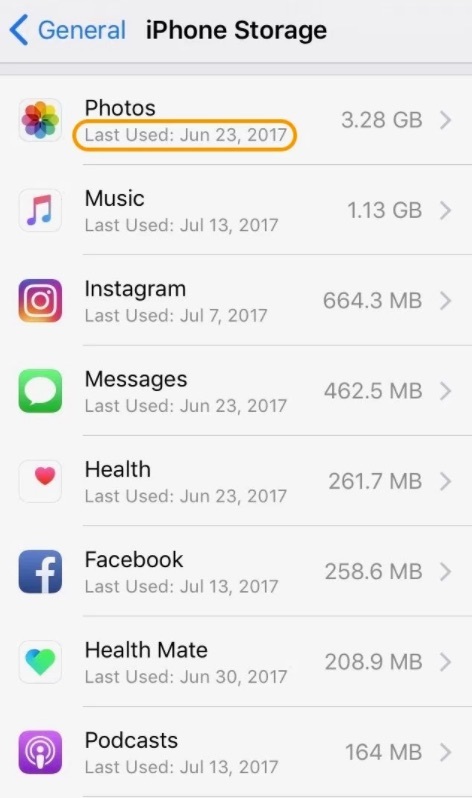 Scroll down in iPhone Storage panel, find which apps use most of your storage. Delete unwanted ones and uninstall / redownload the ones you still need. 3. Enable 'Offload Unused Apps'. Offload unused apps is a great feature in iOS 11 that delete the unused apps from your iOS device. You even do not have to worry about your document and data as iPhone still hold them. So, you can re-download these apps whenever you need them. 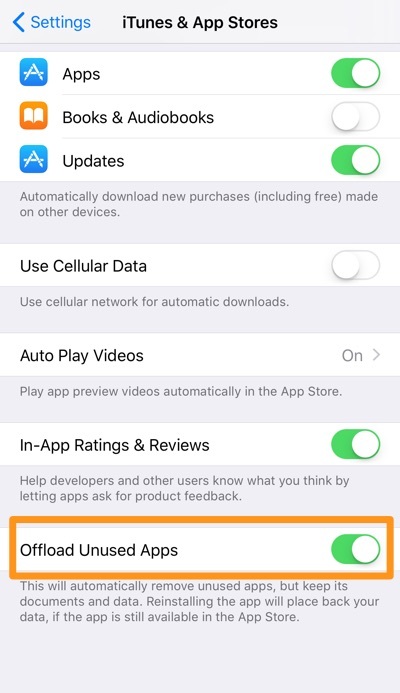 Settings> iTunes and app store> Offload unused apps and enable it. iCloud Photo Library is great and all, but if your 5GB free iCloud storage is running out, give Google Photos a chance to save your photo collections. 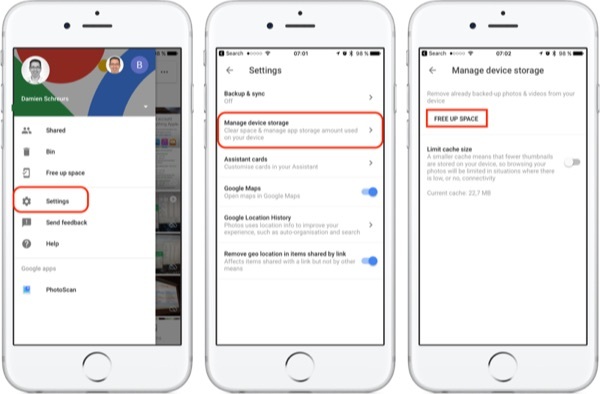 Open Google Photos > Settings > Manage device storage > Free up space. Message is an easily ignorable place to free up more space on your iPhone. Give a check on your Messages, especially these groups, and clean up useless ones. In iOS 11, we have more options to free up iPhone space with recommended settings. 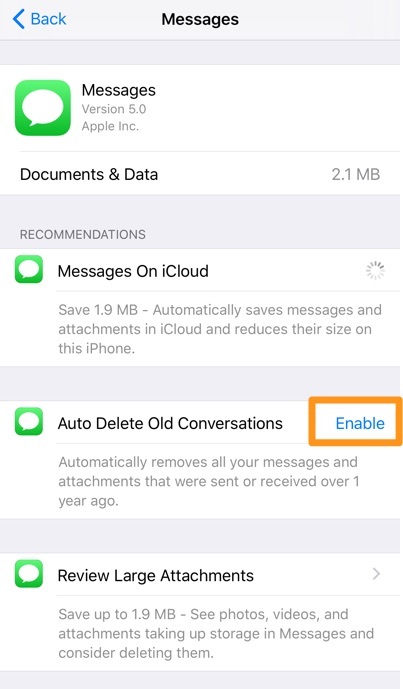 Open Settings > General > iPhone Storage > Scroll down to find Messages option > Enable these Recommendations. Continue to scroll down to find Documents and Data > Choose specific catagory > Click Edit > Select files > Click Trash can to lean up useless files. 6. Turn Off Live Photos. 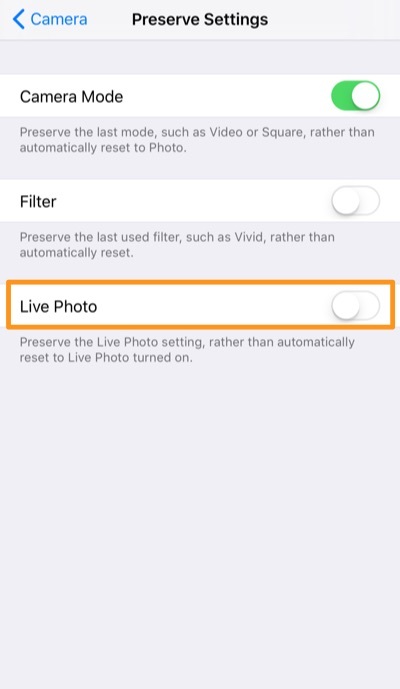 If you're not a fan of Apple Live Photos, turning it off will save you a large portion of storage on your iPhone. Open Settings > Camera > Preserve Settings > Turn off Live Photos. 7. Turn Off My Photo Stream. By enabling My Photo Stream, you'll zap your iPhone storage space too. Not only does it save your recent 1000 photos to iCloud, it also saves them in its own folder on your device. Turn it off to maximize your iPhone storage and you can always turn it back on later. 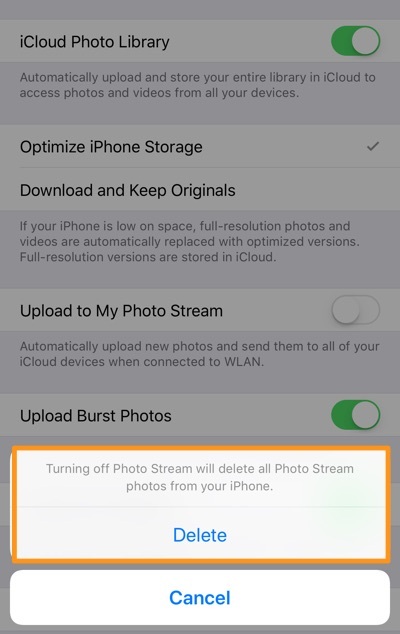 Open Settings > Photos > Turn off Upload to My Photo Stream > Confirm to delete photos from your iPhone. 8. 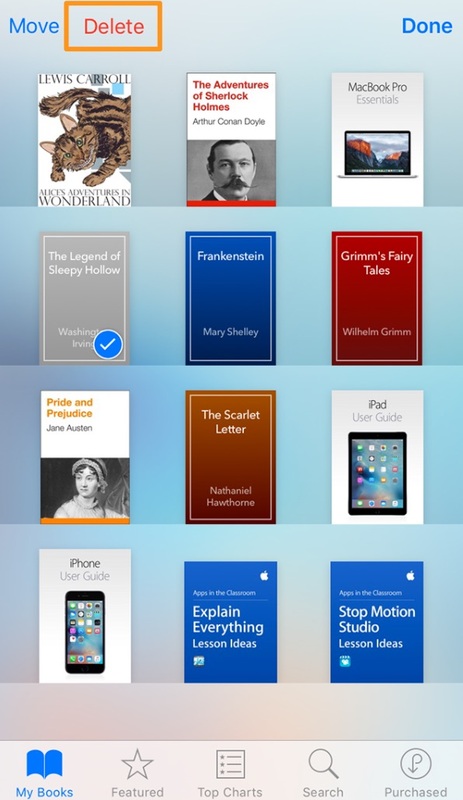 Delete Old iBooks and Podcasts. If you've finished with reading an iBook or listening podcast, remember to clean them up since in most cases, we'll not do a reading or listening again. Feel free to delete them and you can re-download these iPhone content at any time. 9. Download from Streaming Services. 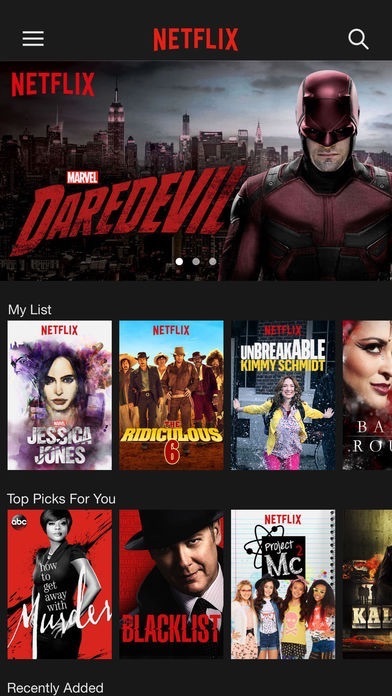 Instead of buying individual songs, movies or series TV Shows, whose files are too big to keep on your iPhone, just subscribe to streaming services. This will relief you from huge 'iPhone storage is full' crisis. 10. Clear Safari browser cache. If you use Safari all the time, your iPhone may be storing web history and data that you simply do not need. 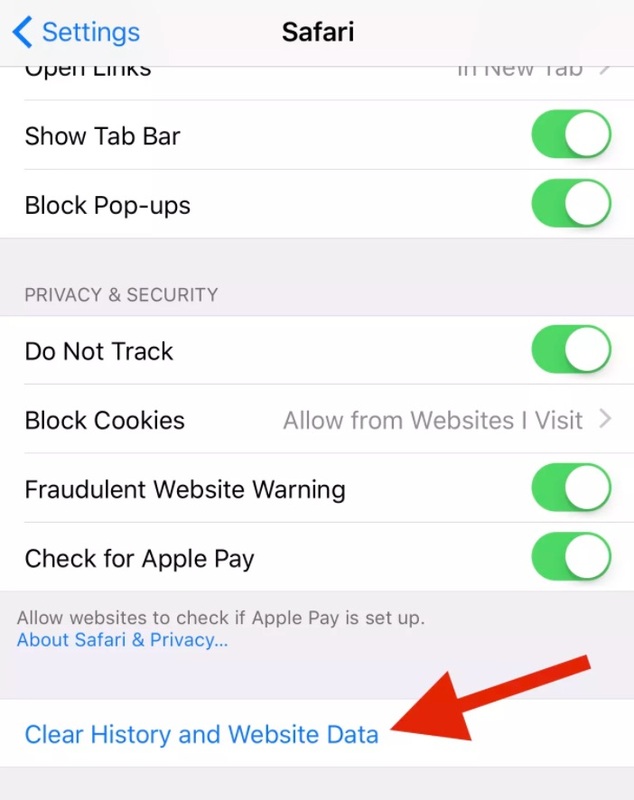 To clear Safari's browser cache, open up the Settings app and tap Safari. Scroll down and click Clear History and Website Data. Get More iPhone Storage Tips? Drop A Line to Us. Do you have similar tips and tricks that can revive iPhone storage space, but most people, unfortunately, don't know about? If you're an awesome iPhone hacker, feel free to leave a comment and we are happy to hear from you. The new iPhone 8 (maybe iPhone X) is around the corner, so do you prepare yourself for the update? Here are a bunch of exciting iPhone 8 news and tips that may smooth your way of new iPhone upgrade. Copyright © 2018 MiniCreo | All Rights Reserved | Site Map | iPod, iPhone, iPad, iTunes, Apple TV, Mac, and the Apple logo are trademarks of Apple Inc. MiniCreo software is not developed by or affiliated with Apple Inc.